Color color!... Just makes me happy to see all these bowls floating in my sink. And with 2009, I'm starting the new year with colorful and bright bowls. Thought, ok... time to try out these fun bowls and I've seen them at Anthropologie for a while now, so I drove over there today and bought some! Welcome to the Robinson house bright happy bowls! Isn't it funny how small things that you use everyday can just put a skip in your step?? And along with the trip to my favorite store to pick up the happy bowls..... I also made a trip to my favorite library (libraries are great!) and picked up some very inspiring reads. My goal for the new year... read more .... read ....read.... I love biographies and finding out about people's lives, so here are a few color filled lives that I can't wait to read! Tracy Porter.... have loved this book for years now! In fact, her book inspired me to start painting. She lives in the country and has little ponies and hand painted furniture and beauty beauty all around! Kim Parker: At Home. Oh, my, I had no idea this book was even in existence until I saw it on the shelf! I adore her flower creations... Her home is filled with bright flowers everywhere... paintings, fabric, pillows and dresses....pure fun! Circle of Quiet: by Madeline L'engle. This author is one of my favorites and also I consider her a mentor in my life. Love how she talks about God and creativity in "Walking on Water" and I haven't read "Circle of Quiet" in about 6 years or so, am looking forward to visiting it again. I could read Madeline L'engle all the time! She is continued inspiration. Aubrey Hepburn, An Elegant Spirit....Love her movies and want to know more about her life... so I'm trying this one out. At Home with Kate: I am intrigued by Katherine Hepburn too. So want to read about her life and get a more detailed view of her day to day. Lady Bird Johnson: Looking forward to reading about her too! So there you have it! 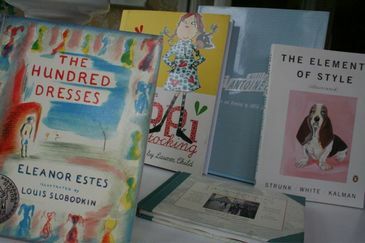 ...SIX great women to read about this month of January... now the question is... which book first? And can I have these all read in 3 weeks??? UMMM.. probably not. But will start in today!! yipee! 1. It is filled with Tasha Tudor's beautiful paintings. 2. It takes a journey through all the months of the year and their special celebrations....from January days to Easter to fourth of July, birthdays, harvest days to Christmas. 3 It's a book our family sees everyday as we pass by the hall table. It's fun to have this book out on our front table because I keep the pages open to the month we are living in. I think it is kind of exciting when we say goodbye to one month and move on to the fresh new one. So thankful God made seasons and rhythms of the year....it's comforting and refreshing all at the same time. And now the comfort is being in the days of sweet August. Can definitely relate to the quote that is used for August, " My heart is like a singing bird." Thinking of our Rosie and the excitement and buzz that is in the air as we prepare to return to Russia. I think our entire house is filled with "hearts like singing birds" for we are all so very excited to have Rosie in our arms. Sam is practicing reading his favorite books to her, Mike is getting all the final paperwork mailed and I am making my little "Rosie" projects that involve paint, fabric and happy pink stuff! For Tasha's family birthdays, they walk to the creek in the evening and float the candle lit birthday cake down the stream. It's beautiful just looking at the way Tasha paints these nights of wonder, of celebrating. And I can only imagine how beautiful that would be to see in person. Hmmm... let's see, where is a stream close by that we can float our next birthday cake on? We have my dad's and my father in law's birthday parties coming up.... I think the glow of candles on a cake and the people you love around you... singing happy birthday is pretty magical and fairy-like in itself. Pippi arrived today! Yipee! Isn't the illustration so whimsy and bright? I love what Lauren Childs creates; she has such a frolicky crafty way of illustrating. I'll have to admit that when the brown amazon box arrives in the mail, it becomes a very good day. These books have been on my wish list for a while and they finally made their journey to their new home. 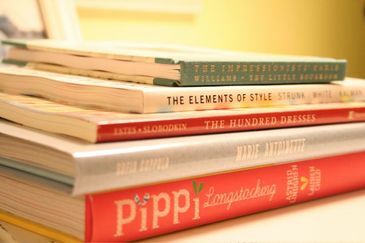 Welcome Pippi and The Hundred Dresses and Marie Antoinette and Paris and Maira Kalman. Let's introduce you! I think everyone knows who Pippy Longstocking is but you know, I have never read her stories. It's a shame because I was named "pippi longstocking look alike" in school, so I should know something about her. But even at 36, it's never too late to start reading. I'm so excited about reading Pippi to Sam. I told him tonight about the book and he just looked at me and said... "ohhh nooo", but he said it with a smile on his face so that shows he is interested. I think it is because he just tries to be 5 year old cool. He secretly likes some girl books, but of course he has to put on the coolness of a five year old just in case one of his neighbor friends overhears in the bushes or something. 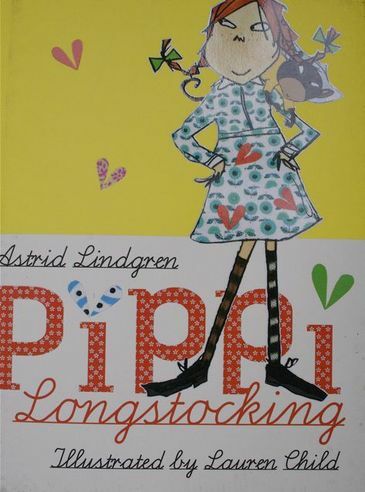 Here is a little blurb about the author, Astrid Lindgren. She was born 100 years ago on a farm in Sweden. She began to write the Pippi stories to entertain her daughter Karin. And the first book was published in 1945. Today, Pippi is beloved all over the world, and the books have been translated into 91 languages! WowWW! Now about the illustrator, Lauren Child. She was born in England and is a long time fan of Pippi whom she calls, "an entirely free spirit". Lauren has some of her own memorable girl characters... Clarice Bean and Lola from Charlie and Lola. Ok.. on to book #2. "The Hundred Dresses". Oh, so excited! This is about a girl named Wanda who wears the same faded blue dress to school everyday but says she has one hundred beautiful dresses all line up at home. I won't go into detail, but there are lessons learned on kindness and generosity of spirit. It is also a Newbery Honor book. book #3. "The Elements of Style" Mainly I got this because of the very talented and whimsical illustrator, Maira Kalman. Love her work! Plus the book's mantra, make every word tell. Have lots to learn from that. book #4 "The Impressionist's Paris" It has 3 walking tours in Paris where one follows in the footsteps of Monet, Renoir, Manet, Degas and others. Sounds like the perfect book to take to Paris! Or I can just go to Paris via imagination with book in hand. book #5 Last but not least, "Marie Antoinette" It contains the photos of the movie Sophia Coppola made. The movie is brilliant as far as artistry goes. The colors, the dresses... each scene is like a painting. Look forward to pouring over the photos and getting more ideas. Now the books are on my nightstand and they are about to be read and loved. Don't you just love fresh new books?